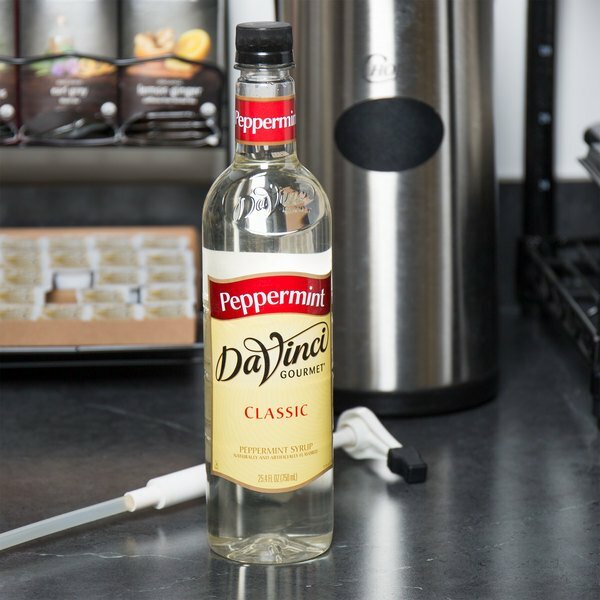 Choose from over 60 classic flavors, and discover the rich taste and quality consistency in each and every DaVinci Gourmet product, including this peppermint flavoring syrup! DaVinci Gourmet flavoring syrups are made from pure cane sugar to complement your beverages without overpowering them or being too sweet. They are specially formulated to hold up well under heat, making them the perfect choice for espresso-based drinks, brewed coffee or tea, and more. 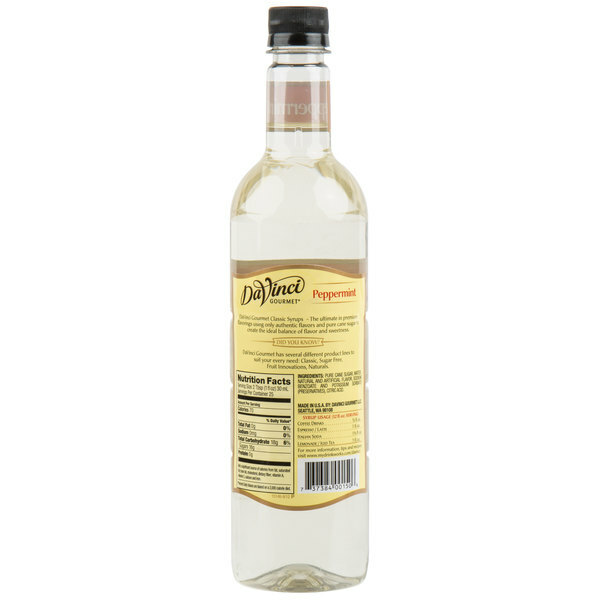 Mix this refreshingly minty syrup into milkshakes, hot cocoa, lattes, or add it to cocktails. You can even use it with baking ingredients to quickly and easily enhance your dessert recipes. No matter how it is used, customers will be sure to love the fresh, aromatic flavor to their drinks and food! We go through case after case after case of this peppermint flavoring during the holidays. It is so good to make peppermint lattes and add a mini candy cane. With this syrup a little goes a long way. Flavor is smooth and strong. Definitely brings out the undertones of other flavors when mixed with them. The classic peppermint syrup is divine and very refreshing. A great way to make peppermint hot cocoa quickly. Such a great product and price for this syrup. This peppermint flavoring syrup is an especially popular addition around the holidays at our shop. We made sure to buy this stuff in bulk this time because last year we sold out. It is a great syrup. The peppermint flavoring syrup is great and very minty. A nice way to make peppermint, herbal tea that is great for soothing a sore throat. 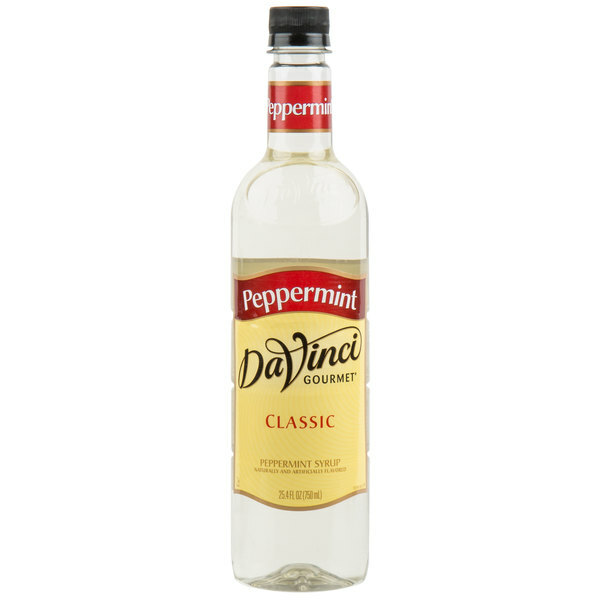 The DaVinci gourmet classic peppermint flavoring syrup is a great syrup bursting with the fresh and clean taste of peppermint. It is great for adding a splash to your coffee our cocoa.